Vicki is the Project Manager of Global Health Nexus. She practiced law for over 20 years, representing businesses and local governments. In 2008, Vicki started her own consulting firm, handling community outreach, strategic planning and implementation, fundraising, and advocacy in a broad array of areas including healthcare, education, and political and public policy. 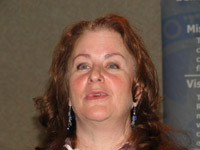 A member of Bellevue Rotary Club, Vicki is also Chair of the Bellevue College Board of Trustees. In addition, she is immediate past-chair of the Center for Women and Democracy, and the Bellevue Rotary Vocational Awards Committee. She also served as a Trustee for the Overlake Hospital Foundation, and Chair of the Bellevue Planning Commission. Vicki was also appointed by the U.S. Secretary of Treasury to the Pacific Northwest IRS Citizen Advocacy Panel, and served as Vice Chair as well as Chair of the Small Business Subcommittee. She earned her juris doctorate and bachelor’s degrees from the University of Wisconsin. Vicki Orrico of Global Health Nexus spoke about partnering with Prosperity Partnership and Washington Biotechnology and Biomedical Association to enhance public awareness of global health issues. Norm Johnson is the Rotarian of the Month. Wendi Fischer’s daughter Kate reminded us all of what we should have learned in Fifth grade. Joellen Monson spoke about the DECA state leadership conference. Global Health Nexus is an initiative of the Washington Global Health Alliance in partnership with Prosperity Partnership and the Washington Biotechnology and Biomedical Association to bring the Seattle region’s business, research, government and medical community together to build a platform for enhanced collaboration and action. Global Health Nexus raises public awareness of global health issues and provides an avenue for individuals and institutions to contribute to global health solutions. • A Global Health Experience Exhibit which transports visitors into the life of a child in the developing world, featuring global health innovations and solutions from the Pacific Northwest. Themes include malaria, maternal newborn child health, cancer, diabetes and clean water. The exhibit will be held at Seattle Center from July 1-August 31. • Be The Change Student Competition. Across Washington state, hundreds of students have proposed their ideas to improve global health in the 2012 Be the Change global health competition. Stretching from Bellingham to Vancouver and Pullman to Seattle, over 250 students (58 teams) submitted proposals in the inaugural year of the contest. Vicki told us that of the 58 teams that submitted proposals, over 40 were going on to the second round of judging. • Building Faithful Partnerships in Global Health: A Multi-Faith Event will take place on July 15. President John Martinka called the meeting to order at 7:30am. visiting Rotarians and Guests. It was kids’ day at BBRC as Wendi Fischer introduced her kids, Kate and Carson and Traci Tenhulzen introduced her son, Matthew. John awarded Norm Johnson the Rotarian of the Month award for his work on the District Simplified Matching Grant for KITH. Wendi reminded us to register for the District Conference which will be held at the Coeur d’Alene resort on April 20-22. She also reminded us that the Retreat will coincide with the District Conference and will be held on April 21 from noon to 2:30pm. Wendi then transitioned into her Sergeant-At-Arms role and asked her daughter, Kate, to come up to the front. Kate introduced the game, Are you Smarter than a 5th Grader?” Kate then proceeded to question us about Greek & Latin Roots, Math, Spelling Spree, Geometry and Science. I guess we should all go back to the 5th grade since most of us scored a zero or answered only one question correctly. Wendi certainly made a little money this morning. Alex Rule is looking for volunteers to join him at the Preserve Planet Earth event to be held at Ardmore Park in Bellevue from 9:00am – 1:00pm on Saturday, March 24. It is a trail resurfacing project and Alex is hoping for 30 volunteers to participate. Sign up at www.bbrc.net. Colleen Turner gave a friendly reminder for us to continue to bring guests to all BBRC events in order to make the BBRC stronger. She displayed the Rotary Membership Wheel which explains why more members lead to a potential source of more hands and hearts to do the work of Rotary which builds stronger communities and attracts even more Rotarians. Joellen Monson announced that WA DECA (Distributive Education Clubs of America) will be holding its state leadership conference on Saturday, March 10 at Meydenbauer Center in Bellevue. This is an annual event that brings 2,000 high school students from around the state to Bellevue to compete for the honor of representing the state at the International DECA conference to be held in the spring. BBRC provides $1,500-$2,000 annually to WA DECA. A BBRC representative has been invited to go on stage to present the awards for the “Community Service” competition. 1. Jeff Cashman thanked everyone who contributed to The Rotary Foundation and encouraged those who haven’t yet contributed to donate now. 2. Chuck Kimbrough announced that Bellevue 10K brochures and posters were in the back and asked members to distribute them. 3. Dustin Walling announced that David Bolson was the first Rotarian to sign up to volunteer to help with the Bellevue 10K and encouraged everybody else to get with it. 4. Laura Adams Guy thanked Ruben Ladlad for encouraging her son to participate in RYLA. She said RYLA was a growing experience for him. 5. Howard Johnson reminded everyone about the Rotary First Harvest event on Saturday morning, March 10. 6. Jane Kuechle announced that there is a book packing party on March 31 at Northwest Harvest from 9:00am – 12:00pm and is looking for volunteers to help.